My mid-2012 MacBook Air has a spot on the bottom plate. The computer has never been dropped. Does anyone have any idea what could cause this? I took the computer in to Apple, and they determined that the spot was the result of a bulge caused by a piece of foam on the speaker. They told me that the foam and its attached components were the wrong parts. Is that circle actually there in real life, or did you add that to highlight the mark? The scratch could be caused by something as simple as some grit on a table. The feet on the air doesn't keep it very far off a surface, so just sliding the laptop with some grit could do that. Not the answer you're looking for? Browse other questions tagged macbook damage . 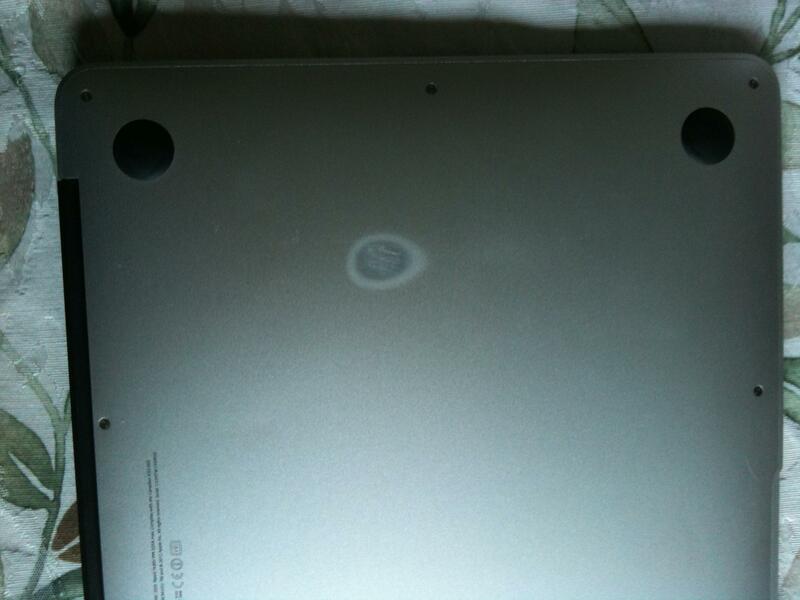 Could aluminium dust inside a Macbook Air create a short circuit? Does the new Air (2012) support Daisy Chaining to two Thunderbolt Displays?